Cruising has come a long way from endless buffets of fried fatty foods and deserts, crowded staterooms and non-existent gyms. 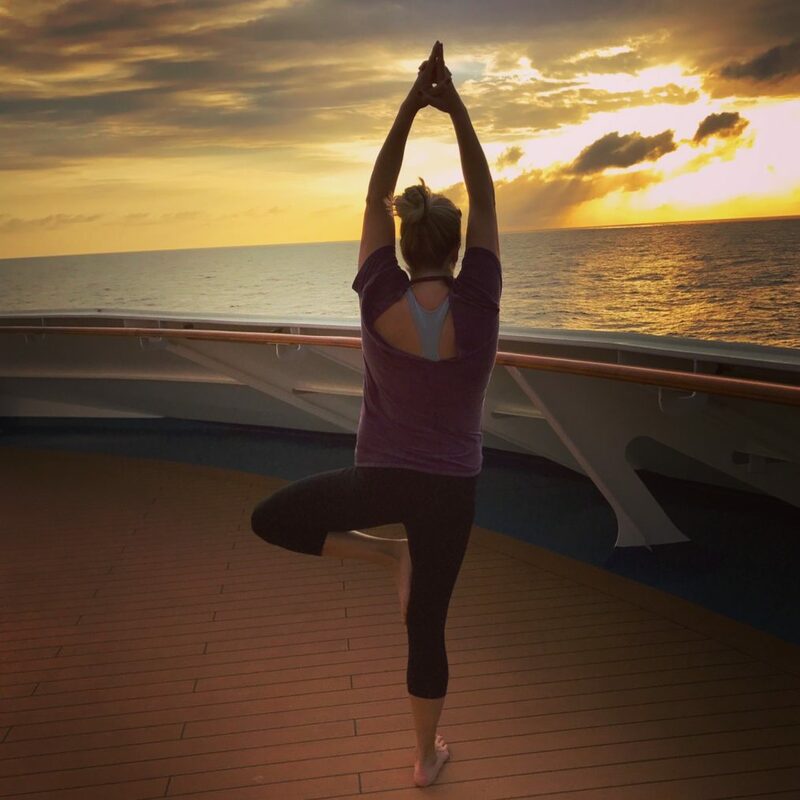 Now days you can take a cruise and actually come back a healthier person! A couple of months ago I went on a Carnival cruise with my family and we had an amazing time. One of the best parts was that I was able to stay fit and healthy and returned feeling refreshed instead of regretful. 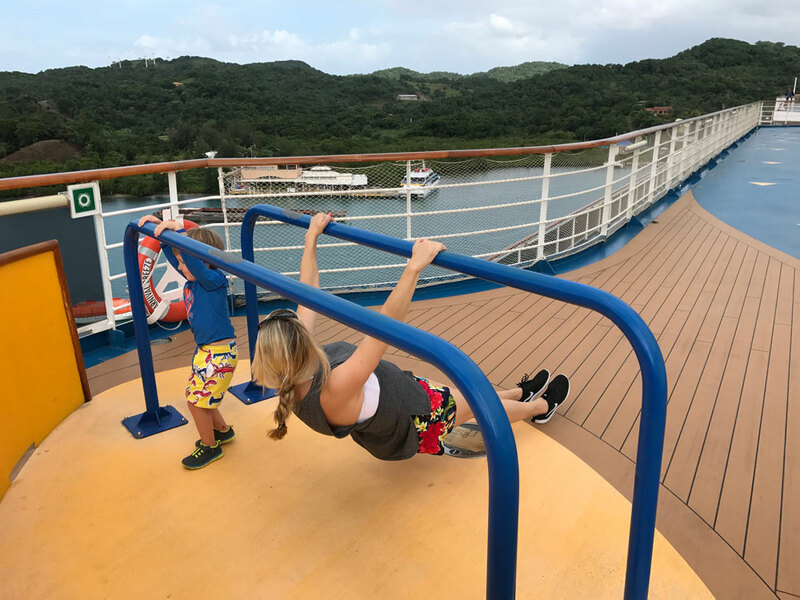 Now, I know that most people aren’t too concerned with weight gain when cruising – but I’m here to tell you it IS possible to keep the big LB’s off and maybe even tone up a little. The best part is that Carnival actually makes it easy if you just put in a little effort and get creative. Below are some tips on how you can make your next cruise a healthy one for you and your family. We decided on the Carnival Breeze ship because it’s a newer ship and visits a couple of places we haven’t been before. If you haven’t taken a cruise in awhile you definitely need to check out Carnival’s fleet. Most are new or have been completely renovated and there is literally something for everyone. Most people look forward to the food and the drinks on vacation and Carnival doesn’t disappoint in this area. However, I was pleasantly surprised by all of the healthy food and drink options, the fitness facilities (who knew they offered spin classes on the water?!) and creative outdoor workout spots (you do crunches while watching dolphins swim by!). Take advantage of the fitness facilities. Most ships have great gyms and fitness centers with a variety of equipment. Carnival not only had a great gym but they had a spin studio, yoga studio and even a fun outdoor gym that the whole family can use. The gym was super nice with a lot of cardio equipment, weight machines and a free weights area. They also had a ropes course, mini golf and other fun things to get your family involved. Just make it a goal to explore a new fitness area (or class) each day. Be active as much as you can. Even if you are not a gym person you can still find ways to burn calories and stay physically fit. 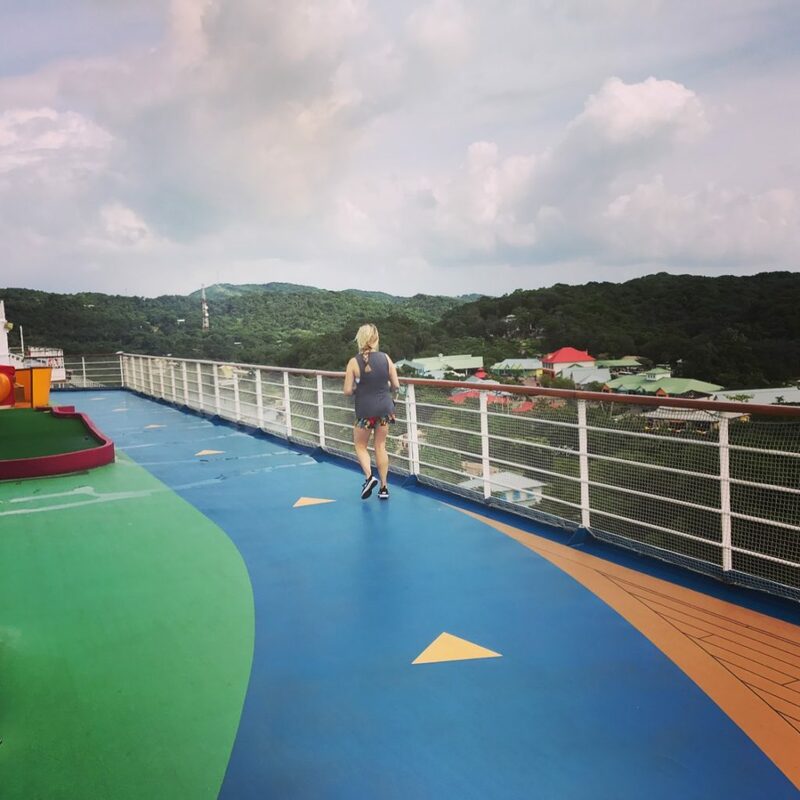 The ship has a walking path that you can use to take a walk around the boat (try a sunset or sunrise walk for a nice view) or go for a jog. If you are a runner – you can even get in your own mini 5k. Also, you can make the pools a place to get fit. The pools are small – so it may be hard to swim laps unless you go during a less busy time like early in the morning – but you can still use it to burn some calories. You can do things like tread water, do tricep dips on the edge (in the water), do leg raises (for core) and lateral shoulder raises (pressing up against the water is great resistance). If nothing else – just go exploring the ship. If your family is with you, you could even do a fun scavenger hunt or see what fun things you can find. Make the buffet your BFF. The words Buffet and Healthy usually don’t go hand in hand. However, I was really surprised by all of the heathly things I could find on Carnival’s Breeze. They also mixed things up daily and had a variety of new healthy choices throughout the week – so I never got bored. Just be sure to watch portions and unlimited items. This is one of the hardest to do while cruising. The buffet areas are packed with tasty treats almost all day long – so temptation is always there. What I did was make sure I filled up on heathy items like veggies, fruits, plain baked chicken or fish (no sauce) first and then if I wanted a small treat I would get one. Not into buffets? They have a variety of specialty restaurants (some like the Steakhouse have an extra charge) that offer a la carte items and you can request that your chicken be cooked without butter or ask for a vegetarian option. They were more than happy to accommodate my requests and one of our waiters even pointed out the healthier items for us one night. 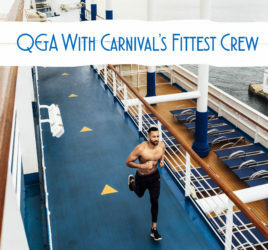 A fun fact – the cruise ship staff are all very fit and health conscience. Some are working on the ship for 6-9 months at a time and their health is their priority. They even have a gym for the crew members to use. Make your room a fit haven. I was surprised how roomy the staterooms are. Yes – they are very small but for a cruise ship they aren’t too bad. Plus, Carnival does a great job making it a very usable space and there are plenty of storage areas and spaces for your things. You can organize your workout clothes by the day of week have itall ready to go each day. You could even squeeze in a workout in your room if you wanted. I loved being outside – so some mornings I would do a quick set of squats, shoulder presses and bicep curls out on my balcony. I also recommend stocking your room with healthy snacks such as fruit (you can bring some back from the buffet), carrot sticks, protein shakes (bring your own shaker bottle) and nuts. Chose a more active excursion. Carnival has lot of fun excursions to choose from. They are also categorized by activity level – so if you are fit and healthy you can choose one that’s a little more active. Some require more walking (wear comfortable shoes) and some activities are just more challenging like horseback riding, zip lining or scuba and snorkel. Make it more of a healthy spa trip vs. an indulgent trip. I like to start my trips with a healthy mindset and treat my trips and cruises like a healthy spa trip vs. an indulgent vacation. If I start off thinking about staying fit, enjoying new fruits and veggies, trying a new fitness class and then rewarding myself with a spa treatment – I’m less likely to return home feeling bloated and out of shape. 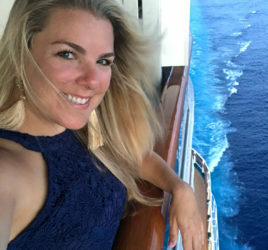 I hope these tips will help you enjoy your next cruise even more and help you return felling fit and healthy! Comment below and share some of your tips for cruising! This post was sponsored by Carnival but all opinions are my own. Great advice as always and perfect timing – I’m going on a Disney cruise soon! Gorgeous pic!! !